A pair of 1930s to WW2 era, I don't think any earlier, matched bowie fighting knifes in very nice condition, longer bowie has a 6 3/4 inch long swept bowie blade which is 1 and a quarter plus inches broad, there are no maker details, shorter bowie has a 3 1/2 inch swept bowie blade which is 3/4 inch broad blade. 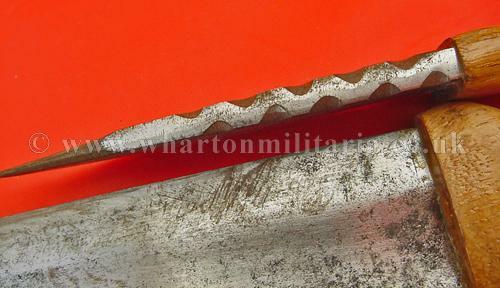 Each blade has a matched one piece wooden crossguard, grip and pommel, very much in the style of a gladiator fighting knife of ancient times. 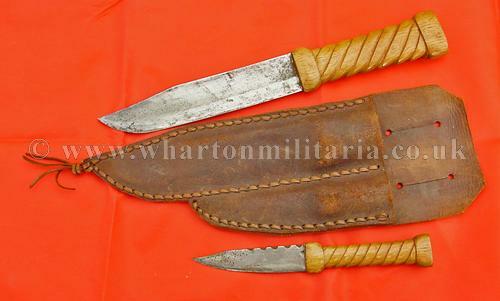 A not often seen double scabbard/sheath, made in leather. 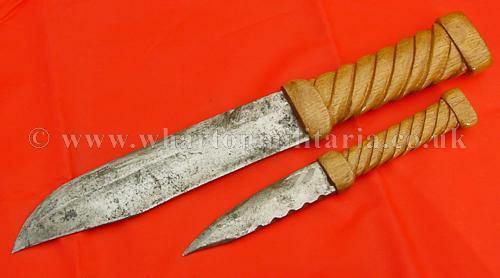 An interesting pair of fighting knives.